Have you ever wondered how you could put a little more sparkle into your tests? Perhaps you feel your horse needs you to continually nag and niggle at them to put more effort in? Or maybe you find you are treading a fine line between impulsion and explosion? Maybe you’d just like to feel that you both have a smile on your face as you school! To discover how to make dressage more rewarding, for both you and your horse, sign up for this workshop with Dr Helen Spence. From getting a square halt every time, through to developing lateral work in hand and beginning piaffe and passage, this will be of interest to dressage riders of all levels. Discover just how important relaxation is to the scales of training. Helen will talk about how simple issues like management styles and feeding can impact on behaviour. More importantly, she will explain and demonstrate just how important it is to train in a way that the horse finds truly rewarding. This will include, but not be limited to, an introduction to training with a clicker and food (known by some as clicker training!). This workshop will be hosted by Claire Sedgeman at her yard near Dromore, on Saturday 12th September from 10am to 5pm. Cost for the day is £40 and places are limited so please book early! To book your space please contact Helen by email info@helenspencehorsesense.co.uk or phone 07773 157428. 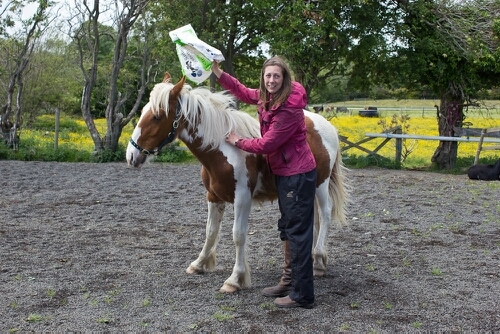 Foaly undergoing systematic desensitisation and counter conditioning to a plastic bag using scratching as the counter condition. As you can see he is in an open space and at liberty to move away should he wish. I could have used a clicker to teach this, since it is one of the many tools in my training tool box, but, since he was enjoying the scratches so much, I chose to use them instead. I’ve never felt particularly comfortable with the term ‘clicker training‘. In the past, I’ve used it, simply because it’s a term that people seemed to understand / recognise. But a number of years ago I discovered that what was going on ‘out there’ was clicker training, but not as I knew it! So I made a deliberate point of talking about ‘training with the clicker ‘, ‘using a clicker’, ‘training including, but not limited to, the use of a clicker’. Why did I feel the need to make this discrimination? My blog post ‘Don’t get stuck in a box’ probably goes a long way towards explaining this. Basically, it’s because I’m not a fan of ‘methods’ of horsemanship. I think they are very limiting and restrictive. The second you begin to call yourself a ‘clicker trainer‘, you are putting yourself in a box. The clicker is simply a tool in the tool box. To call yourself a ‘clicker trainer ‘ is akin to calling someone who rides with a bit or spurs a ‘bit trainer‘ or ‘spur trainer‘. It is a rather limiting term and certainly isn’t descriptive of all that they are likely to do. Good trainers understand ALL the potential motivators that they can manipulate in order to help achieve the results they are looking for. Perhaps more importantly, the best trainers understand the impact that these motivators have on the emotional state of the horse. I prefer to focus on helping people to understand the bigger picture of learning theory- the importance of emotions, the ability to read and understand how the horse is feeling, to be able to analyse a situation and recognise what behaviour is being reinforced (increasing in frequency or duration) or punished (decreasing in frequency or duration), what associations might be being formed between stimuli or events and how they make the horse feel. I also teach about behaviour modification techniques, equine ethology, welfare and ethics, management and feeding practices, individual differences (personality), stress and anxiety and, perhaps most importantly, the influence that we, the trainers, and how we are feeling, may have on the horses we are working with. Although I feel that that ALL ‘clicker trainers’ should be doing all of that, I also feel that ALL trainers should be doing all of that! So to my mind, it renders the term ‘clicker training‘ redundant. Instead, all we need is ‘ good training‘, and, perhaps more importantly, good education for trainers! 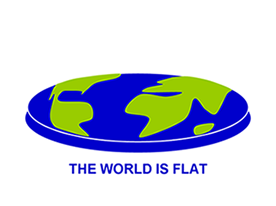 But the world is flat…. Cognitive dissonance and horse training. Imagine the following scenario. You live in a community that believes that the world is flat. Throughout your childhood, at school and at home, you have been repeatedly told that the world is flat. The evidence of your own eyes clearly supports that view. As far as you can see, the land stretches out, quite clearly flat.Then one day, a traveller (me) appears in your midst proclaiming that the world is round. Imagine how you would feel. How ridiculous is this traveller? Are they crazy? Or stupid? What they (I) say directly contradicts everything you have been told by those that you admire and respect. And it appears to contradict the physical evidence that you are observing. But then the traveller (me) begins to explain just how it is that they know that the world is round. “I have travelled right around it”. They present video and satellite photographs to confirm that what they say is true. All of a sudden you are faced with a choice. Accept the evidence that I place before you and change your mind and your viewpoint. And perhaps also have to change what you do and how you do it. Or refuse to believe what I have to say, no matter how clear my evidence may be, and stay steadfast in your original view, regardless of how the scientific evidence may contradict that. The emotional discomfort that you face when your viewpoint is challenged is what is known as ‘cognitive dissonance’. It is a very uncomfortable / unpleasant state to be in, and few choose to remain there, instead either stepping forward into the new world of possibilities or stepping back into the comfort of denial and dismissal. I make no apologies for at times saying things on this blog that cause discomfort, although I do my best at all times to minimise that discomfort, where possible. Change is uncomfortable, but without change we stagnate, we do not grow. I’m not immune to the effect of cognitive dissonance. I certainly don’t know it all or have all the answers. At times my views are challenged. I like to think that I step forwards bravely each time this happens. But I don’t blindly accept what I’m told either. I’ve been trained to think critically, to analyse and to question, to seek the evidence that supports the theories, and to seek that from a variety of sources. As Nick Thompson the homeopathic vet said to me over a decade ago, keep an open mind, but without letting your brain fall out. If we want to be the best trainers that we can be, we can’t just blindly accept what we are told by ‘the experts’ or those we admire, nor can we necessarily accept the evidence of our own eyes. We need to read deeper, observe more widely, and, most importantly, we need to look at the science and what the evidence there suggests we should do. I don’t train the way I train now because it’s what I was taught to do, or because it’s what everyone else does, or even because ‘it works’. I train the way I train because, when I studied psychology, (and more specifically, learning theory, animal behaviour and welfare, and emotions, neuroscience and learning) I experienced cognitive dissonance, I realised that what I thought I knew about horse training didn’t sit so well with what the evidence suggested was the most ethical way to train. I therefore changed the way I trained so that I felt that I was training in the best way I could according to the evidence that was now available to me. That has been a continually evolving process for me since I graduated in1999. I am still travelling. I’d like to invite you to be brave, travel with me, don’t just do what you do because it’s what’s always been done, or because it works. Find out more, probe deeper, help develop our knowledge and understanding. As we do this, remember to never apply the science in a mechanical way, but always to understand that the horse is a living emotional being. And if you know that something I say on this blog is incorrect or inaccurate, and you can provide the evidence based explanation for why that is the case, then please do share it with me, because I also wish to continue my journey, not to stagnate, not to believe that the world is flat! Evasions, avoidance… The pitfalls of pressure based training? I recently saw this image and I couldn’t resist sharing it with a few comments from the behaviour/ training viewpoint . Training with pressure/discomfort/pain works by tapping into natural escape or avoidance responses. One of the disadvantages, from a trainer’s perspective, is that sometimes these escape/ avoidance responses can backfire, for example, ‘evasions’ such as jaw crossing, putting the tongue over the bit, or more extreme forms of avoidance, as demonstrated in this image. If you insist on using aversive stimuli as training tools (any form of pressure is, by definition, an aversive stimulus, because it works by creating an avoidance response, that’s why the release IS a release), then you should be aware that, if your horse demonstrates the kind of behaviour seen in this image, they are simply trying to tell you that they do not enjoy experiencing those aversive stimuli, and will do their best to avoid them. Some horses will go so far as to avoid being caught. This is often the only opportunity that the horse gets to express how they feel, and to make choices. Next time you approach your horse with the bridle, pause a moment and observe their reaction. They may not throw their head in the air, but many horses will show much more subtle signs of discomfort, from turning the head slightly away, to just a momentary quietness, perhaps a swallow, or a tightening of the facial muscles. In my experience, the minority of horses will actively and happily choose to have the bridle on. Those that do, tend to be those who have the most calm, quiet, consistent, considerate, fair and gentle riders. Once the equipment (in this case the bridle) used to apply the aversive stimuli is in place, the opportunity for many horses to feel they can express how they feel/ choose what to do is gone (learned helplessness). It takes skill to recognise whether a horse is ‘compliant’ because they are happy/ comfortable or because they have learned there is no point expressing themselves. The point BEFORE the bridle goes on (as discussed above) is often the easiest time to see the truth. The few horses that do demonstrate ‘inappropriate’ (from the human perspective) avoidance responses while wearing tack/ ridden are labelled ‘bad’ or ‘dangerous’. The mistake that I see many horse people make is that they view the behaviour as a problem to be fixed, rather than understanding what it really is, which is a cry for help from the horse, an expression of their emotional state and an attempt to communicate that to the human. 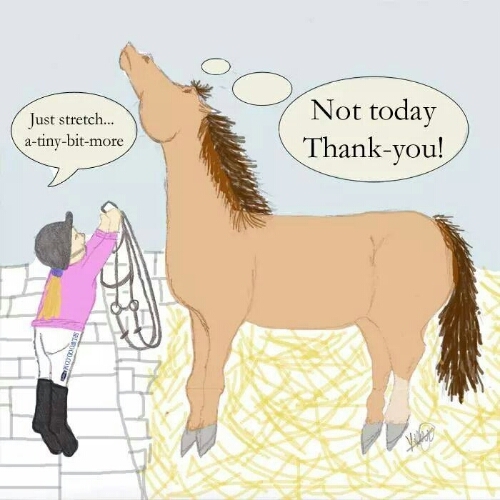 The good news is, if we recognise this, we can take steps to address this, by making better use of appetitive stimuli in training in order to change how the horse feels, to help shift the emotional balance towards a happier state of mind. The even better news is that, with appetitive stimuli and allowing choice and listening to what they have to say, not only can we teach horses to do everything that we’ve always taught them, but they will be happier and truly willing partners, which makes the whole experience more enjoyable for all concerned. Once you’ve experienced the joy of working with a horse that has been trained this way, you will never look at mainstream horse training in the same way again, I can promise you. Thank you to the artist! Do you think you have a nervous horse? Perhaps your horse is difficult to catch? Or sharp and spooky? Do you have a horse that bites or kicks? Maybe your horse seems to you to be stubborn or ignorant? Does your horse barge and push at you? 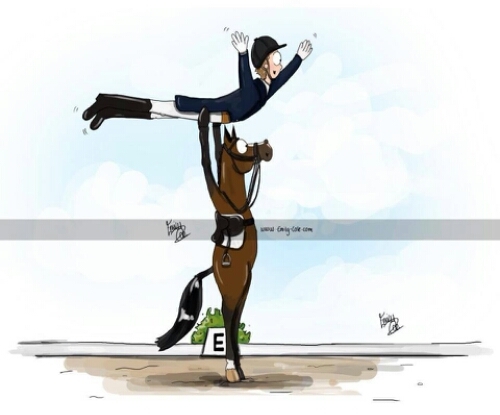 Have people told you your horse needs to learn to respect you, or that you need to be ‘dominant’? To better understand the evidence based answers to these questions and to learn more about what makes horses tick, why your horse behaves the way they do, and the most ethical, kind and effective way of training them, why don’t you sign up for this enjoyable and interesting one day workshop with Dr Helen Spence. Helen will explain how lessons learned from the field of psychology can help us to improve our training skills, in combination with a practical ability to read horse body language and understand the impact of our own physical and emotional state. The focus will be on learning to recognise what kind of motivation we are using and how that feels for the horse, and how to make better use of rewards (appetitives) when training. This will include, but not be limited to, the use of a tool known as a ‘clicker’. This workshop is in Williamstown, Galway, by kind permission of Leigh Spooner and Cathy Griffin, on Saturday 23rd June from 11am to 5 pm. The demo horses are all rescues from the ISPCA and we have a great variety of personalities and issues to work with on the day. The day costs €40 per person and a percentage will be donated to the ISPCA to help with their equine work. In order to book your place please contact Helen by email info@helenspencehorsesense.co.uk or by phone +447773 157428 by Monday 18th August. Dr Helen Spence has a degree in Psychology and a PhD in the field of horse behaviour and welfare. She has been in business since 2003 as an equine behaviour and training consultant and over that time has taught workshops for everyone from happy hackers to professional trainers, has lectured in horse behaviour to postgraduate level, and is recognised as an expert in the field.